Punch registration systems use a paper punch and registration pins to align paper and plates. 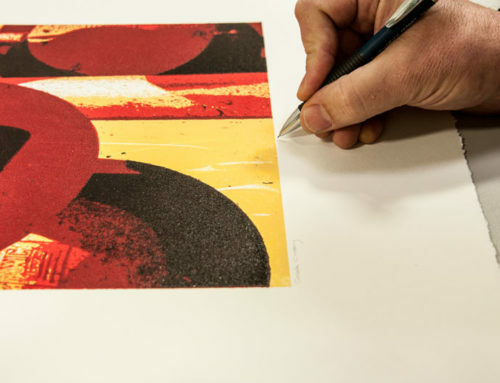 I have experimented with this kind of system in the past, but I like to maintain the deckle edges on my paper, so the idea of trimming off the punches after printing did not hold a lot of appeal. 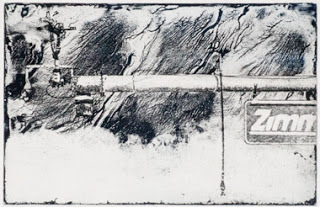 On my most recent woodcut, I tried a new variation that overcomes this objective and seems to work very well. 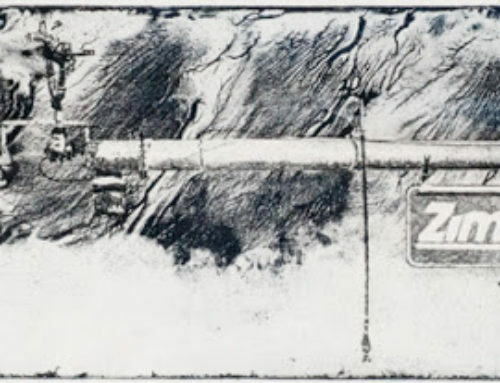 The first step in consistent registration is making sure that your plates are exactly the same size and that the image is in register relative to the edges of the plate. You then need a way to repeatably position the plate relative to an external reference. To do this, I use two L-shaped pieces of 1/8″ MDF, with a couple of pieces of double stick carpet tape on the back of them. I place the first one down, with the long edge parallel to the press roller. A rap over the tape with a mallet ensures that it is stuck down solidly. The width of the long arm of this L needs to be at least an inch and a half or so wider than the margin on the edition paper. 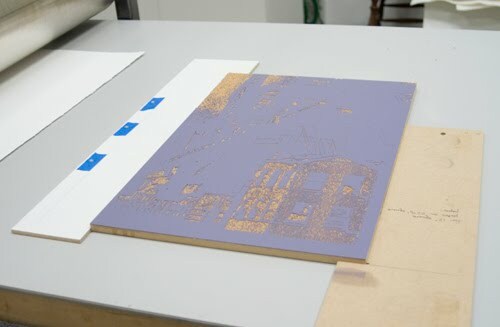 I then place the first plate against the MDF, tight against the corner of the L. I then place a second L at the opposite diagonal corner, also taped down to the bed of the press. If you have done this right, and all of your plates are exactly the same size you should be able to lift the plate out and put a different one into place easily, there should be no lateral movement of the plate when it is in place. The next step is to create a set of punched sheets, one for each sheet of paper in the edition. To do this you can use a specialized registration punch, or an ordinary 3 hole paper punch purchased from a local office supply store. The key is to make sure that you can find pins that precisely match the diameter of the holes created by the punch. The exact spacing of the holes is not critical. These pins are fairly specialized equipment and are not particularly cheap, but the good news is that they should last nearly forever. I purchased these from Takach Press. 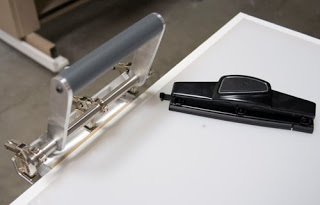 Cut a strip of heavy paper or Mylar about 2″ wide and long enough to straddle all of the holes in your punch for each of the sheets of paper in your edition. Punch holes in each of these sheets. The critical item here is that the spacing between these holes be exactly the same on each of these sheets. The position of the pattern of holes on the paper itself is not critical. This should be easy since the spacing of the holes is determined by the punch. Place a sheet of your edition paper face down on the press bed in the proper position for printing. 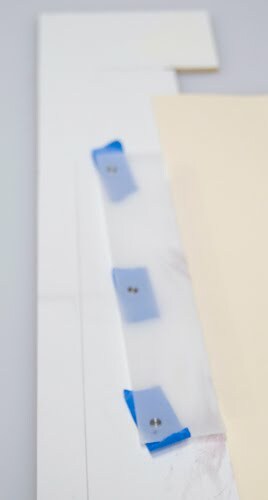 Place one of the punched sheets on top of the edition paper with the holes hanging over the edge of the paper, but over the registration L. Then tape the punched paper to the back of the edition paper. You want to use a tape that holds securely and yet can be removed without pulling up fibers from the edition paper. I used Scotch Removable tape for this. I used two long strips of tape, the first running along the edge and the second overlapping the first and extending further out on to the edition sheet. In this photo, the punch sheet is butted up against the edge of the paper. I have found, however, that the tape holds better if the two overlap somewhat. Next, take 3 pieces of masking tape and punch a hole in them with the punch. Take the tape and place it over the registration pin. 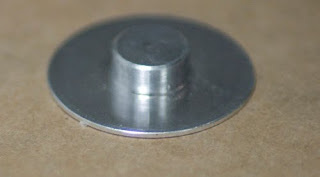 Then take the pins and slip them under the punch sheet and push the head of a registration pin through each of the holes. If the holes and pins match in size they should pretty much stay there by themselves. The pins in position in the punch sheet. Make sure that the edition paper is in the right position for printing and then carefully smooth the tape down, sticking the pin to the L. Once they are firmly in position, peel the edition paper / punch sheet off of the pins. At this point your first sheet of edition paper is ready to go. Take another punch sheet and place it over the pins. You usually have to work the pins through the holes one at a time. The next punch sheet in position. Take your next sheet of edition paper and slide it into the proper position making sure that the paper goes under the edge of the punch sheet. 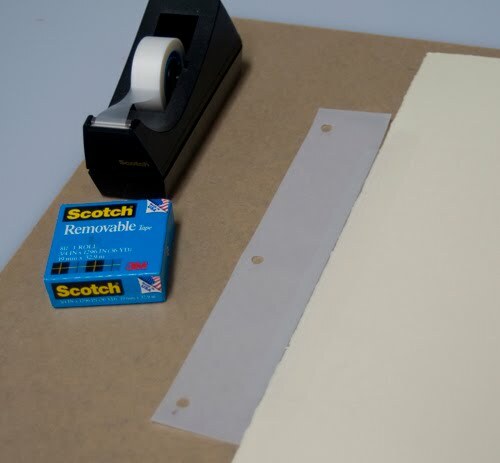 Once there, tape the punch sheet to the edition paper as before. 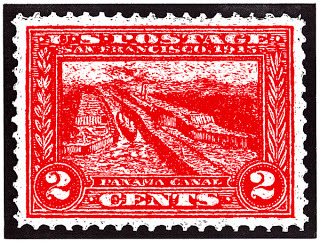 Peel the combination off of the pins and repeat for each of the remaining sheets of edition paper. Now you are ready to lay down your first color. Put the plate in place and ink it. 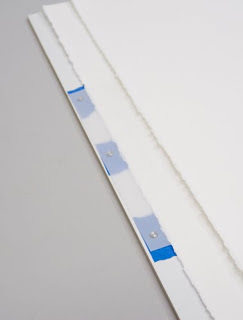 Take your first sheet of edition paper and holding the edge up away from the plate with your right hand, work the punch sheet down over the registration pins with your left. 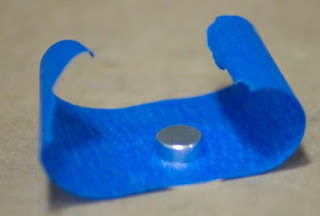 (If you are left handed, you will probably find it easier to reverse the whole thing and have the pins on the right) Once you have done so, hold the punch sheet down so that it cannot come off of the pins and put a little tension on the sheet with your right hand. Then gently lower the sheet into contact with the plate. 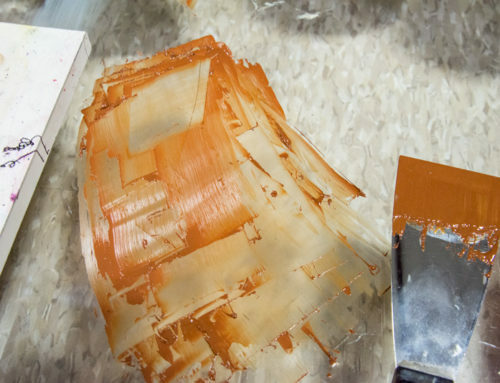 Put your impression sheet(s) in place and you are ready to run it through the press. For consistency, I have the pins lead under the press roller first (so that any slip pulls the paper into tension against the pins). I also lift the plate and move the press back after each impression so that the bed of the press travels the same way for each proof. 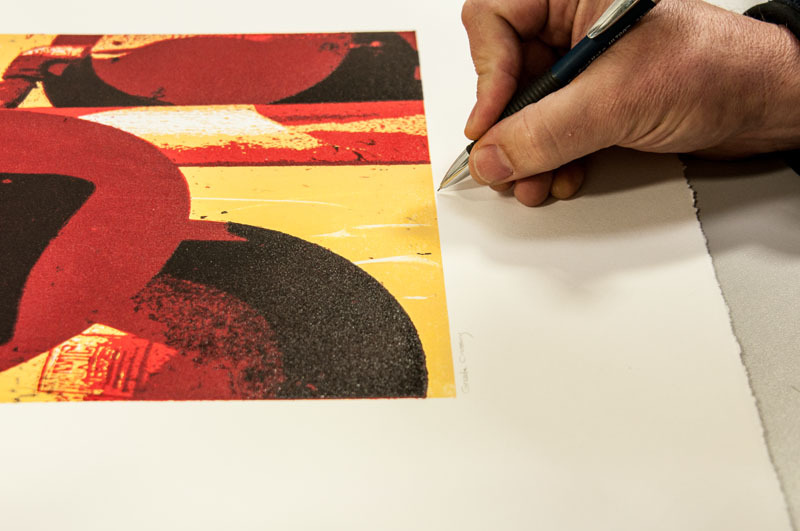 Print your first color on each of the sheets, let it dry as appropriate and then do the next color in the same way. 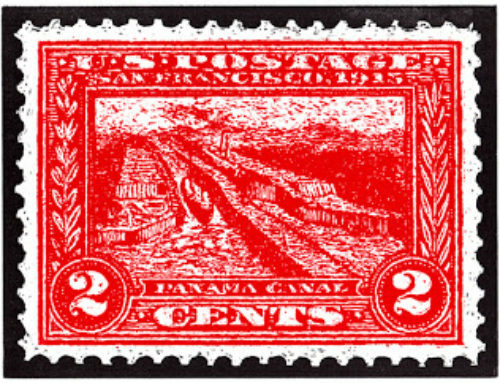 The punch sheet remains taped to the edition sheet through the whole process. 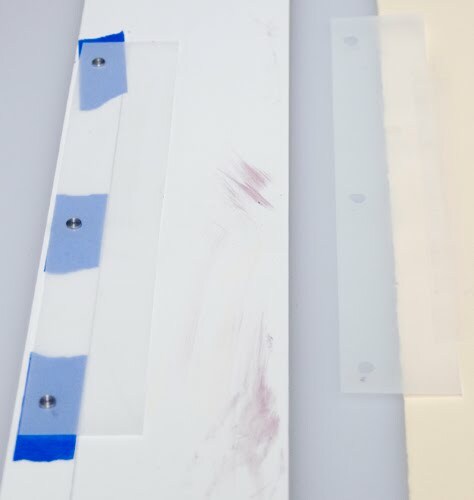 When the last color is down, gently peel the tape off separating the punch sheet and the edition sheet. Your deckle will be pristine and your registration tight and consistent. In this example, I am printing a woodcut with 1/2″ plate material, so the printing surface sits 1/4″ higher than the surface of the L. This allows the pins to move under the press roller without touching it. 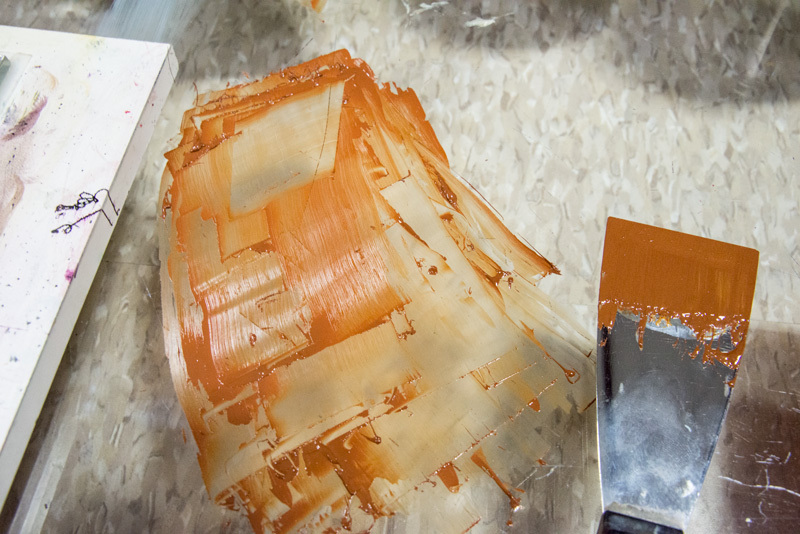 If you are using unmounted Linoleum or an intaglio plate, you need to shim the plate up so that the pins will clear the roller. This seems elaborate, but it really isn’t all that complicated. Using the first sheet to position the pins on the registration L establishes a repeatable positioning of the pins to the plate. 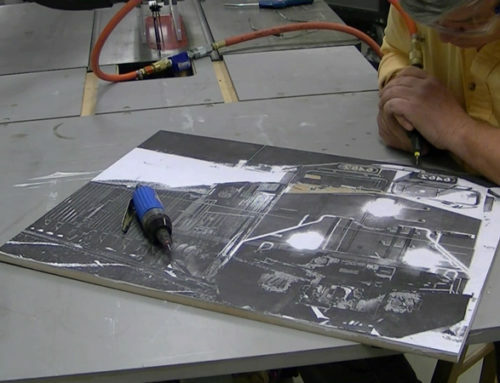 Subsequent sheets are positioned relative to the plate and then are locked into that position by taping the punch sheet and the edition sheet together. Whenever possible, you want to position things such that the punch sheet attaches to the middle of the long edge of the print. This is important as it will help to minimize the effects of any slop in the system. thanks for this great explanation–i’m going to give your method a try! 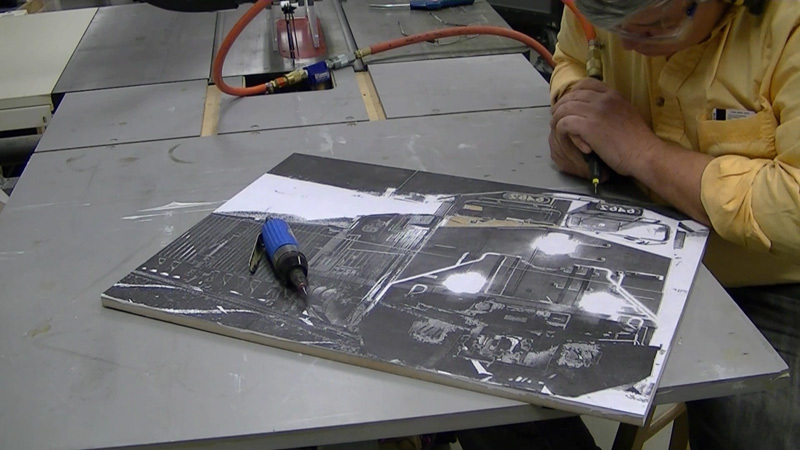 thanks for this great explanation–i plan to try out your method for my next woodcut.